While a number of management options are needed to control giant salvinia, biological control, through the use salvinia weevils, is now recognized as the one option that has to be included for lakes such as Caddo Lake. It is simply not possible to get herbicide spray into the heavily forested areas of the lake, where giant salvinia can maintain a strong nursery to spread to other parts of the lake. Weevils can get into those back water and swampy areas. The use of weevils has proven successful in Australia and parts of southern Louisiana. The weevils are not, however, cold tolerant and they can be a challenge to grow and maintain on lakes as far north as Caddo Lake in Texas and Lake Bistineau in Louisiana. 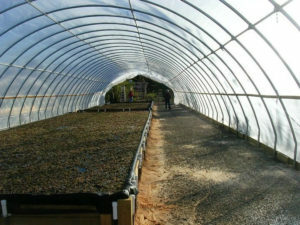 Thus, greenhouses with shallow tanks for rearing salvinia weevils are needed to maintain significant numbers of weevils during periods of winter freezes. In 2010, Texas A&M’s Center for Invasive Species Eradication (CISE) funded the first greenhouse for raising weevils. It was built at the Caddo Lake National Wildlife Refuge with the assistance of CLI and many local volunteers and others. At CLI’s urging, Senator Kay Bailey Hutchison directed funding from the U.S. Department of Agriculture to CISE for the project. The facility has been used mainly for research, not having the capacity for large scale production of weevils. To date, that research has focused on efficient rearing procedures, development of cold tolerant weevils, and the best steps for releasing the weevils on lakes such as Caddo Lake. See, http://cise.tamu.edu/caddo/ for more information on the CISE work. That work made it possible to build production facilities at Caddo and other lakes in the region. In 2014, a second greenhouse was constructed in Uncertain, Texas as a production facility to allow large scale release of salvinia weevils on Caddo Lake. Research is also a part of that facility’s mission. It is operated by the new non-profit organization, the Caddo Biocontrol Alliance, with funds provided by CLI, the Greater Caddo Lake Association of Texas, Harrison County, the City of Uncertain, the Cypress Valley Navigation District, the Texas Parks and Wildlife Department and inidividuals. The new production greenhouse has been named for Morley Hudson, whose family provided a large contribution to make construction of the greenhouse possible. The goal of the operation for 2015 is to release 165,000 weevils. Because of its location, the Morley Hudson greenhouse provides a good opportunity to expand the public’s understanding of the invasive species that are on Caddo Lake and the management tools, such as weevils, that need to be used.